Fed up of over exceed of your monthly data usage? This is actually the most common problem that most of the internet users face. As they don’t realize about how much data they have consumed and thus data over exceed increase their monthly expenses on the internet. A limit data usage software is the solution that you would need to help you control the internet usage. These software restrict internet usage on your system when certain usage limit is crossed. There are countless limit data usage software available that you can try for free. Here is the top list that are best to be utilized. NetWorx is another free limit data usage software that effectively helps to monitor bandwidth of your internet consumption. With this software you can identify the speed of your network and possible problematic sources with which your network speed may be hindered. It lets you set alerts so that whenever it encounters suspicious activity it can let you know about that. Bitmeter 2 is a powerful bandwidth meter that helps you monitor your internet connection through a visually scrolling graph showing you upload and download speed regularly. It also lets you know about the complete historical data of your bandwidth consumption, uploads and download. This software is available for free of cost online. 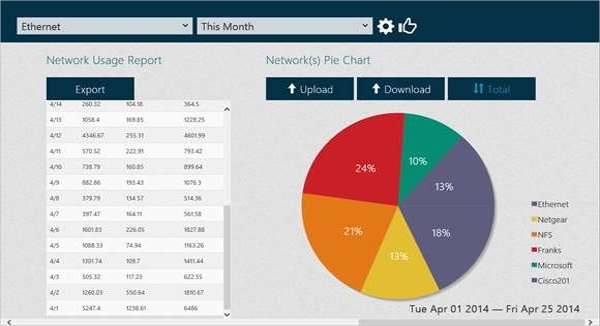 So download today and start monitoring your network for better usage. Bandwidth Manager is another limit data usage free software that is helpful in setting download and upload speed and limits. It can also help you in preventing access to some of the blacklisted websites. It can work with all of the hardware you have with your windows system and helps to control bandwidth to control your monthly data usage cost. You can download its trial version for free. 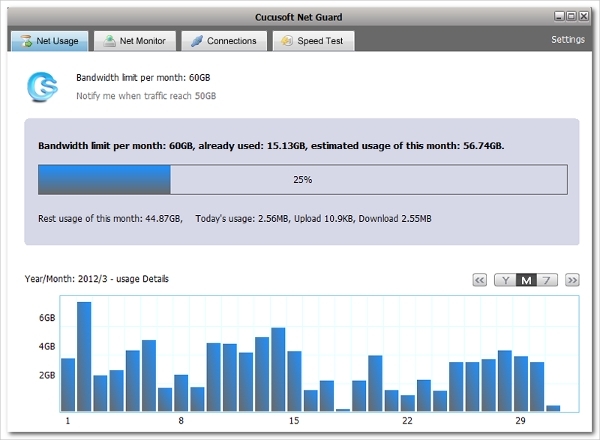 Cucusoft Net Guard is a powerful network monitoring software available for free that allows you to monitor the usage of your broadband connection, optimize its speed and help in removal of any malware that is consuming your network bandwidth. It offers you complete bandwidth usage report so that you can know about how and where you data has been utilized. 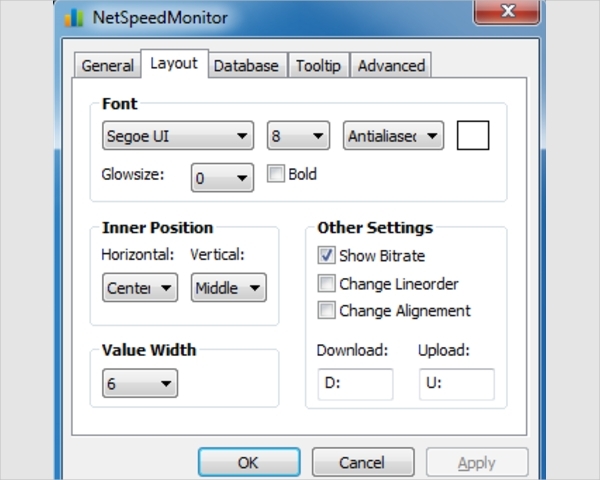 Try ISP monitor as your limit data usage freeware and monitor various internet usage activities effectively. This tool helps you to track your download stats, test the speed of your network connection, traffic monitoring in real time, disc monitoring and more. It supplies complete traffic stats along with letting you know about how much internet volume you have used at a time. This is totally free software available for download online. 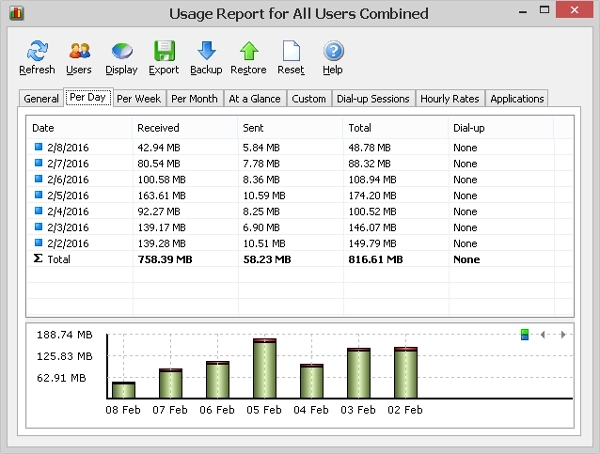 NetSpeedMonitor is one of the best limit data usage software developed to help you in monitoring your data usage activities and restrict access to the internet whenever you exceed the usage limit. This software is compatible with windows 8, windows 7, windows XP, vista, 2003 and windows NT. Download this software for free and take control over your monthly internet expenses. What is Limit Data Usage Software? Limit data usage software is a set of programs developed to help various internet users to monitor and control their data usage while also optimizing network speed and more. Some of the limit data usage tools even help you in detecting any malware or viruses on your system that are consuming some of your data while some other software helps in optimizing network speed so that you can have optimum utilization of your network bandwidth at a controlled network cost. These software can restrict your access to any of the blocked or blacklisted websites and also provide complete historical data of your network usage, uploads and downloads. With these software program you can set the limits and speed of your downloads and uploads as well to control your bandwidth consumption. Limit data usage software canan also help you set alarms to let you know about data usage limits time and again. This way these can help you a lot in monitoring your data usage and consumption. How to Install Limit Data Usage Software? For installation first download limit data usage software from its online resource. If you are trying to download any of the above mentioned software then you can use the download link that we have specified with each of the product. Once your download is complete open the setupset up and it will seek your permission for installation. Read the complete details about the product, term and conditions and policies so that you can be aware of all about the software usage policies. For completing installation you need to get agreed to all the terms. Follow the step by step installation process as guided by the software installation template. You can start using this software as soon as you download it. Bandwidth Monitor – These limit data usage software program help to monitor the bandwidth of your network to let you know about how and where your data is being utilized. Restricted Access to Websites – You might be interested in blocking some of the websites from being accessed to lessen the data consumption especially in your business environment. So these software tools help you to restrict logging into to such blacklisted sites easily. Upload and Download Limit – Limit data usage software monitors your upload and download data while also letting you control upload and download limits and speed as well. Malware Detection & Elimination – There may be malware in your network which may give rise to suspicious activities and unnecessary data usage. These software help to detect all such malware and also eliminate them effectively. Network Speed Optimization – Some of the limit data usage software contribute to a larger extent for optimizing speed of your network by detecting and sorting out various network issues so that you can utilize all your data efficiently. Timeout is one of the best limit data usage software available online for free that helps you in limiting the data usage by restricting usage time of your computer. It can restrict a session limit, restrict web pages from access and can add a day time usage limit so that your network usage may not be exceeded. With this you can activate various modules like, daily quota timer, access window, session time limit, program blocker and site blocker etc. My Data Manager is one of the top limit data usage software for android that can take control of your mobile usage thus helping you in controlling your monthly mobile data bill to a greater extent. 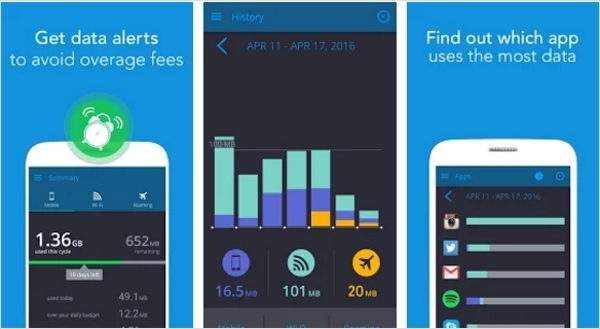 This app monitors your usage of mobile data, WifiWi-Fi or roaming data. With this app you can set alarms and it will prevent you from over exceed of data usage. This app is available for free so download nownot and start monitoring your mobile data usage. 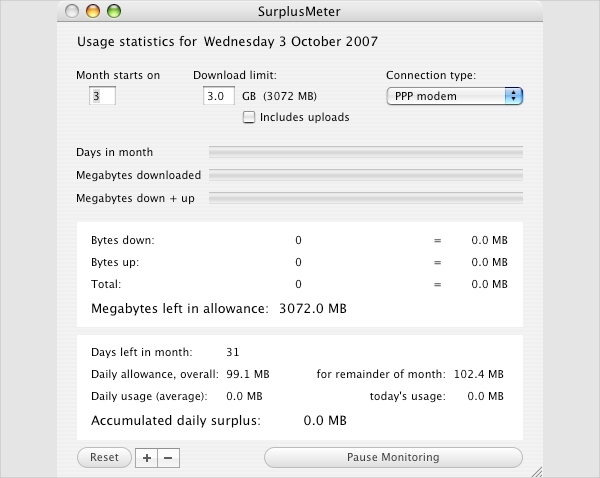 SurplusMeter for Mac is an amazing limit data usage utility for Mac operating systems that helps you in monitoring and measuring download and upload traffic of your network connection thus keeping a record of your traffic volume. It gives you information in term of stats like accumulated surplus, daily allowance and average daily usage. It is totally free software available online for download at below listed page. In addition to all the above listed limit data usage software tools there are numerous others as well that you can try. For windows systems you have options like GroundhogGround Hog, FocalFilter and Web Patrol. For android devices you can have software from 3D Watchdog, Cosco data meter, Mobile Conter and AT&TAT & T All Access. For Mac you can also try PeakHour 3. Microsoft offers Data UsageDataUsage as its limit data usage software that lets you come to know about how much data you have pulled in a month on your device. This software lets you monitor every data flow, set data limits and billing periods thus helping you control your monthly internet costs. Download this software online from below listed page.